For many families, their baby’s baptism is one of the most wonderful events of their upbringing. It’s a day where family and friends gather to celebrate a child’s coming home and introduction to the church. It is also an event where the child’s godparents are named. Normally, the baptism is followed by a party where all the family and friends get together and catch up on life, give gifts to the baby, and celebrate. It’s also a great event to share in food and cake. As such, creative Baptism cakes are becoming a growing trend for these occasions. Below, we will talk about the trend and some of our favorites in Baptism cake designs. There are a number of traditions related to the practice of Baptism. 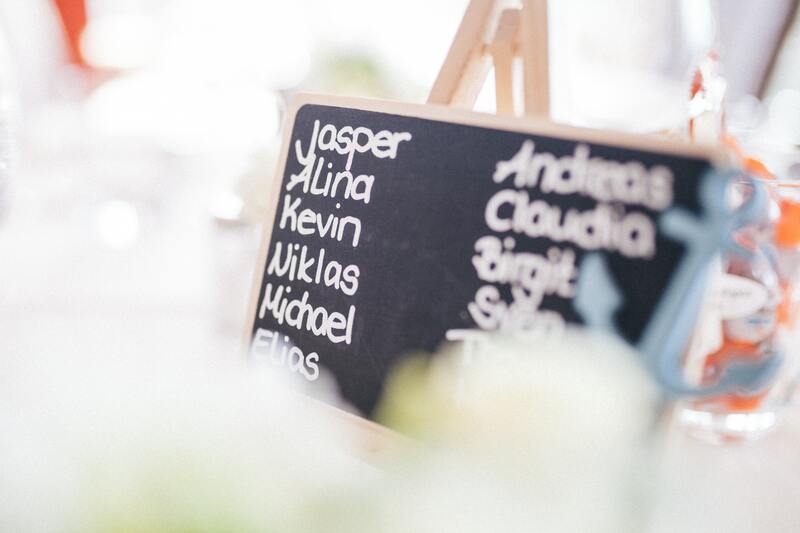 It is at this ceremony that babies sometimes receive their baptismal name. Most of the time, this is practiced in the Catholic Church where the child will be given a saint’s name. As previously stated, this is also when Godparents are typically named for the child. This is a time when parents pick someone they feel close to stand in as a secondary set of parents for the child. For many religious families, baptism is also an event that represents a promise to raise their children to understand and believe in God’s love for them. They take vows committing themselves to the task of raising a child who lives a Godly life. The event of Baptism is not like most other gatherings. There is a sweet but solemn feel to the event, and exercising dignity and respect for the church are important parts of the day. With that said, a baptism cake should never come off as “hokey” or cartoony. Instead, a baptism cake should be designed as elegantly as the day and the ritual for which it represents. We pick the best Baptism cake decorations by looking at each one with a skeptical eye. If it can be misconstrued as a mockery of the ritual or if it comes off looking insincere, it is an automatic no in our book. 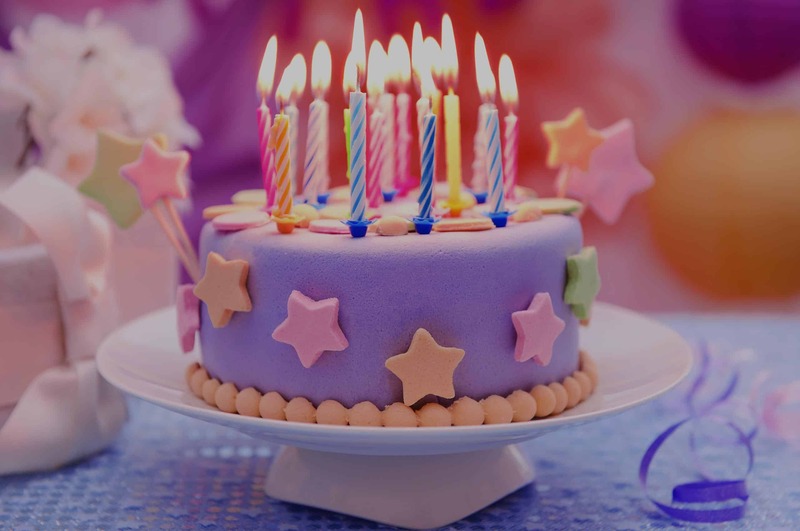 We look for cakes that are designed with elegance, child friendliness, love, and appreciation in mind. 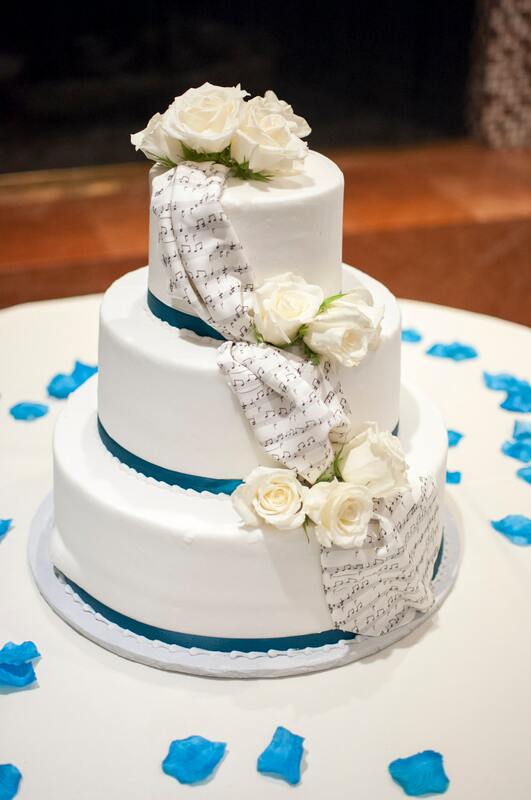 The new tradition of Baptism Cakes is one of our favorites. There are so many adorable new cake designs emerging as cake art becomes an ever popular trend in event planning. Some of these cake designs come off a little better than others, however. There are some, still, that just shouldn’t be done at all. If you are looking for inspiration for your baby’s baptism cake, look no further. Below, we will outline several of our favorites and discuss why they are suitable for your baby’s big day! This will help you determine the best cake designs to represent your baby, your family, and your personal relationship with your faith without risk of looking disrespectful or insincere. Remember this is a day that honors your baby, the Godparents, God, and the church, so you will want to treat the event as sacred, not as a second baby shower or a chance to show off your post baby body. Read ahead for some of our best and classiest cake suggestions. This is an obvious choice for a Baptism cake. Because you are celebrating the devotion of your child to Christ, a simple and elegant cross topper on the cake will make a tasteful and elegant representation of your event. If you would like, you can have the baby’s Christened name written on the cake under the cross to symbolize the day. You can order cross toppers online that can be customized to include your child’s name, birthdate, and date of Baptism, as well. This will make a great keepsake long after the cake is gone. When we are baptized, we are accepting God’s promise that we have a place reserved for us in Heaven. To celebrate this promise, many parents choose to decorate their child’s Baptism cake with heavenly décor. You will often find clouds, angels, the pearly gates, or other Heavenly symbols to commemorate what the event is about. When done tastefully, this can be a very cute cake that is also representative of the peaceful, loving feeling of a new blessing to the family. White roses are a symbol of innocence and purity. 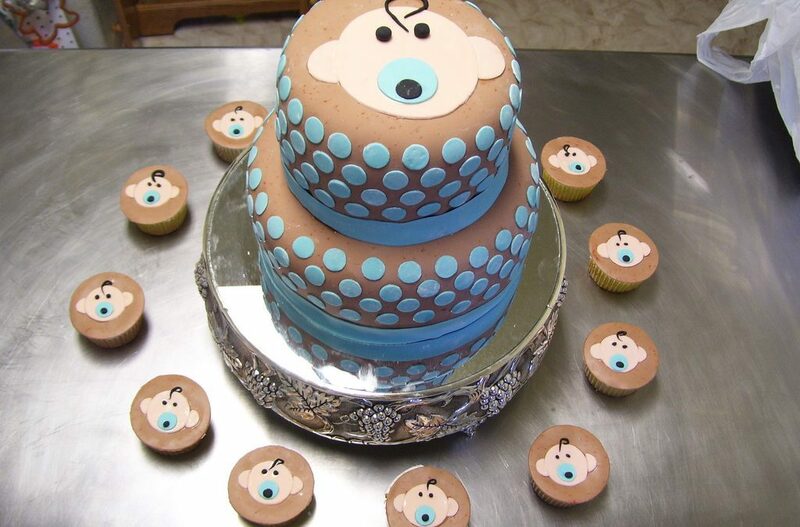 This makes them the perfect way to decorate a cake at a baby’s baptism. 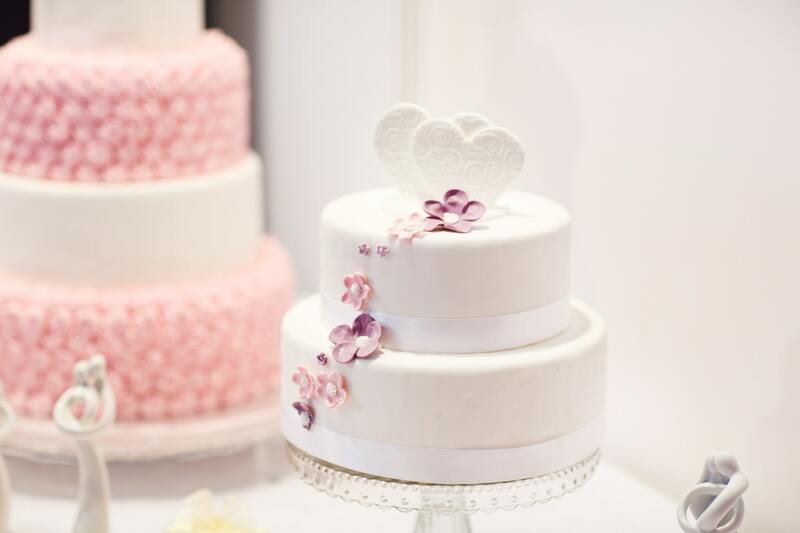 Many times, parents will opt for a simple pastel pink or powder blue cake that is decorated with white rose garnishments. These can be either butter cream roses or real roses that are poked into the cake. Either will look beautiful and create a simple and sweet dessert that you can share with all of your loved ones when they arrive to celebrate your baby’s blessed beginning. Stacked and tiered cakes can easily be decorated to look like a flowing baptismal gown. Baptismal gowns are popular among Catholics and are growing in popularity among other sects of Christianity. The gowns are typically all white and very long. They are meant to show purity and a peaceful beginning. 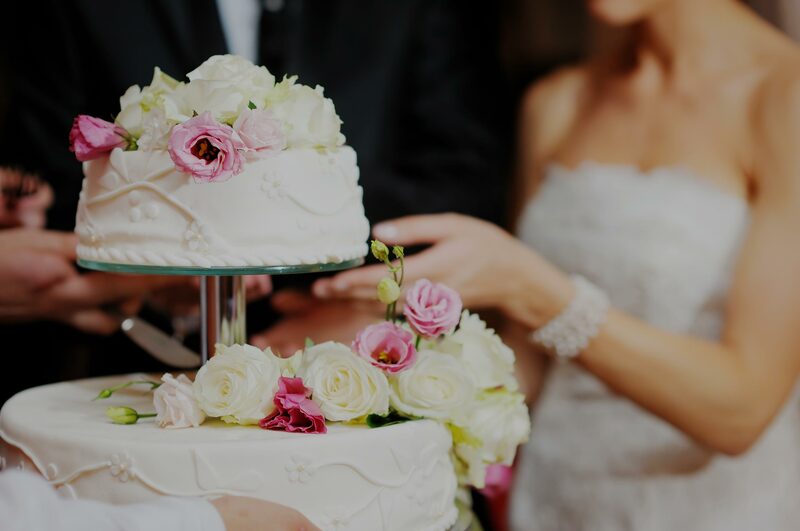 Creating your cake to look like a flowing white Baptismal gown will present a stunning centerpiece for your table as well as a beautiful prop to be used in photos of the event. You get bonus points if you manage to decorate it to look like the actual gown being worn by the honoree. There are a variety of toppers available to commemorate the event. 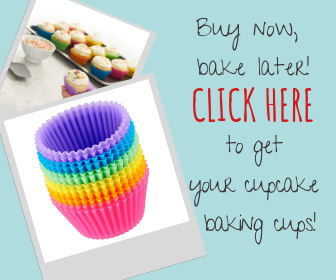 They range from photo toppers to etched glass and more. 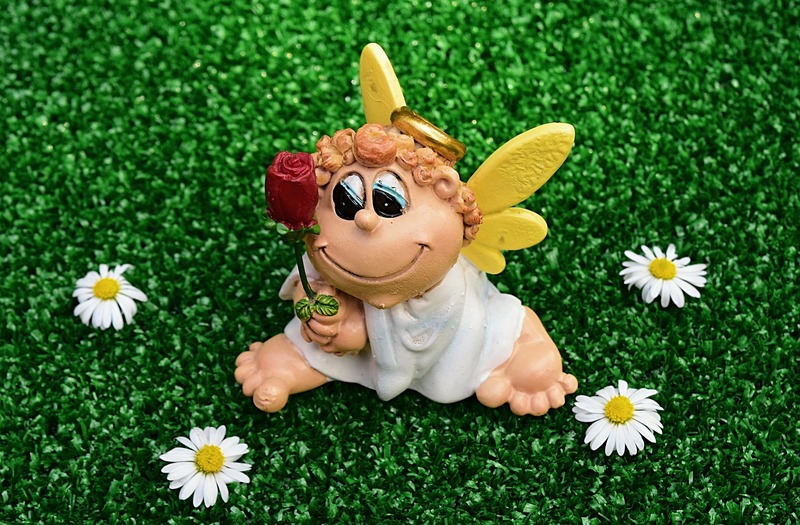 Online creator’s markets will be the best place to shop for a Baptism cake topper that is unique to your child and family. Some parents honor the godparents in the topper since, in a way, it is their special day, too. There is really no end to the ways you can honor a godparent through a topper, whether you are honoring an event in your friendship that was a factor in your decision to choose them or simply etching their names into the topper alongside your baby’s as a keepsake they can take home after the Baptism is over. Just like baptismal gowns are a symbol of the event, so are the little white shoes that match. A fun and easy idea for decorating the top of your baby’s Baptism cake is to buy an extra pair of shoes when you are purchasing your baby’s baptism ensemble. Shoes that match the ones they are wearing can be placed on the cake as a decoration. 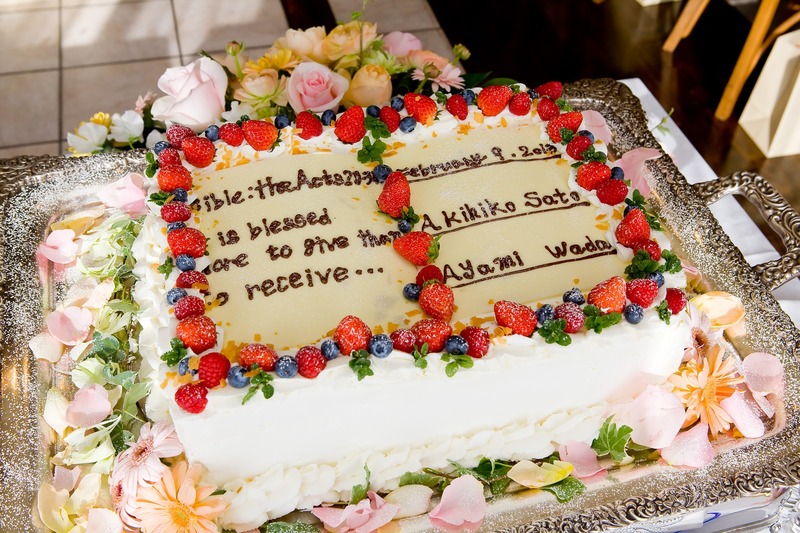 You can then simply have their name, the date, and any other information written onto the cake in decorator’s icing. If you are expecting a large crowd, this is a great way to go because it works well with a standard sheet cake. 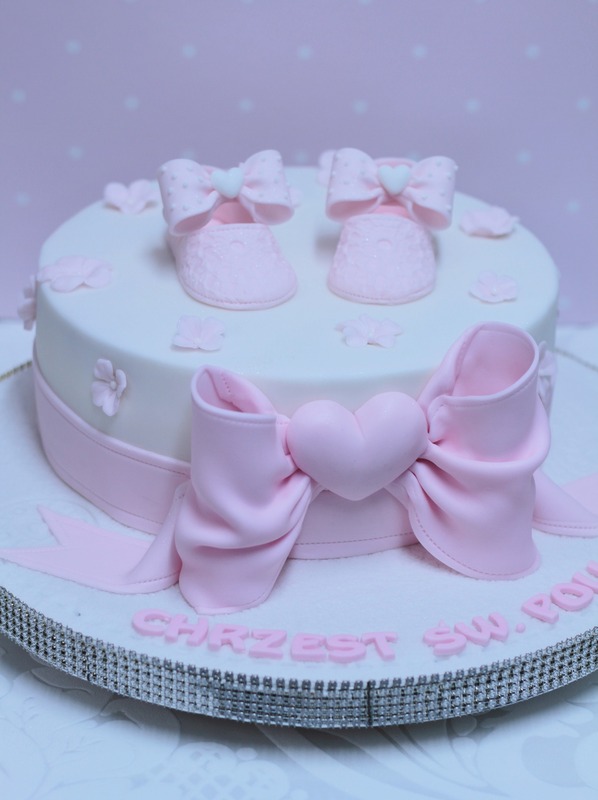 Just as multiple tiers of a cake can be decorated to look like a Baptismal gown, they can also be shaped into a bassinet. This is representative of a new baby and a new life blossoming in your family. The bassinet can be decorated with buttercream flowers, lace, or other embellishments to give it an added flair for the special day. This is another throwback to the Heavenly theme of the day. As the Bible tells us, the streets of Heaven are paved in gold. With edible gold and fake edible gold flake becoming popular trends in cake decorating, you are now able to include them in the celebration of your baby’s Baptism. A little gold flake on the cake will give it an extra elegant feel while still being tasteful, so long as you don’t overdo it. You can also buy gold colored cake toppers to add to the top of the cake, which will carry the theme throughout. Your baby is, without a doubt, the little angel in your life. Why not express that sentiment on the cake? 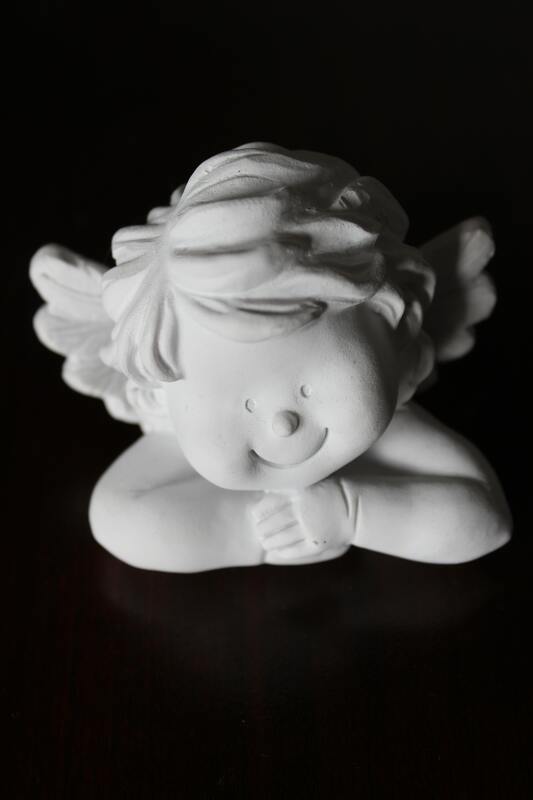 A little angel as a cake topper or even a little angle colored into the frosting will be a tasteful and sweet sentiment to share with your baby’s guests. As your guests come to meet your blessing, be prepared to hear over and over what a sweet angel they are (the Baptism gown will help with this representation). 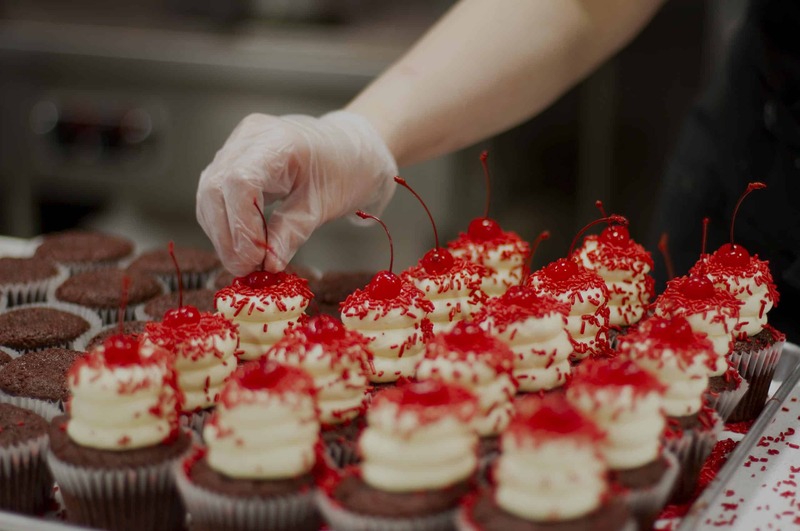 When they are finished, they will certainly understand and appreciate the theme of your chosen dessert. You can select your favorite Bible verse to be written across the top of your child’s Baptism cake. This is a sweet way to reiterate to guests what the event is all about and to declare your personal relationship with God. Choose a verse that is representative of the love you have for your child or the appreciation you feel for your child’s chosen Godparents. Lace is a beautiful and elegant example of innocence. It is found in baptismal gowns and shoes, bassinets, baby blankets, and pretty much all other baby-related dress up accessories. You can incorporate the look into your baptism cake by having lace cut from fondant and delicately placed over the cake. This is especially beautiful if you layer white fondant lace over pastel pink or powder blue and add in a gorgeous cake topper. 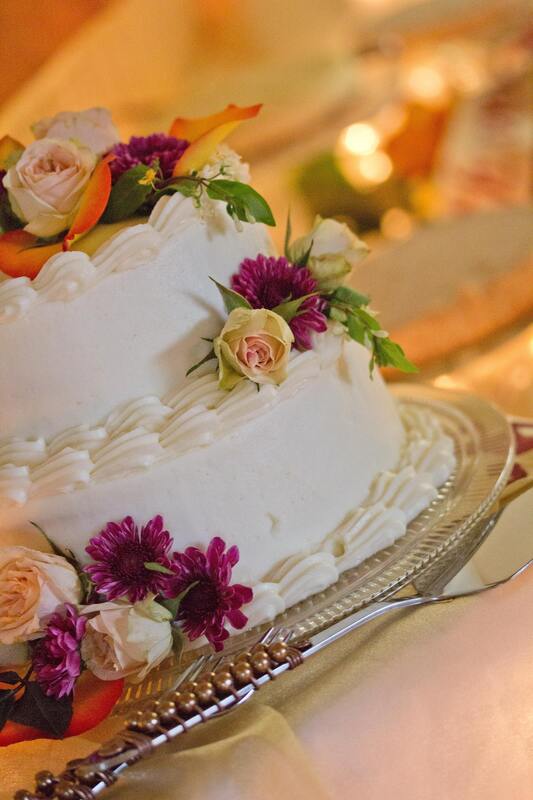 Your guests will be in awe of this cake and some might not even want to cut into it. There are many cake designs and toppers that show hands folded in prayer. This is a beautiful and symbolic decoration that is representative of your desire to raise your child up under the guidance of church and to encourage them to have a personal relationship with God. Remember to be careful with this one, however. Some folded hands decorations are actually designed for funerals. There’s nothing more ghastly than placing a topper on a Baptism cake only to have someone find some small hidden wording about resting in the eternal light. Congratulations on your baby’s day. We know you are very proud of your little one and we hope that the day is as beautiful and full of love as you and your family deserve. We also hope that you have found the perfect Baptism cake idea from the above list. We certainly enjoy each and every one and feel like, regardless of what you choose, it is sure to dazzle and impress all of your loved ones as they come to celebrate your baby’s baptism and the beginning of a beautiful life well-lived.